Truth, honesty, dignity, friendship. Throat, thyroid, larynx, vocal chords, nerves, and the brain. Voice. Power of mind. Intuition. Memory. Releases and heals emotional wounds. Harmonizes the heart and mind. Quickens reflexes. Empowerment, clear choices. Enhances wisdom. Universal Truth. Keep positive outlook. Move into new empowering patterns. Good with Amethyst/Ametrine and Rose Quartz to mellow its effects. Since ancient times, there have been many powers attributed to Lapis, including spiritual growth, psychic ability, protection, potential, memory, meditation, and truth. 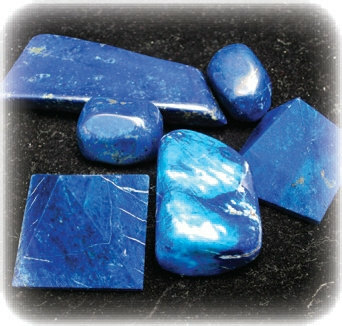 Lapis is a deep balancer, healing chest and throat areas, and helpful for easing stress and trauma from whole body.